February 14, 2017 By Klint Macro & filed under All Articles, Defensive Training Concepts. If we decide to take on the responsibility of being our family’s first responder, a serious training regimen becomes a necessity; a lifestyle choice. Considering how the brain retains information, the body masters skills, and the fact that time, budget, day jobs, and environmental factors are difficult to negotiate, a well-balanced diet of training can be applied so we can train every day of the week, sometimes multiple times a day. In grade school we were introduced to the food pyramid. It was taught that good nutrition consisted of a balanced diet of meats, dairy, grains, vegetables, and so on. We can apply the same concept to our defensive training. Live fire, dry fire, simulated fire, coaching, classes, distance learning, instructional videos, articles, visualization, and mental preparation are all components of a well-balanced training diet. 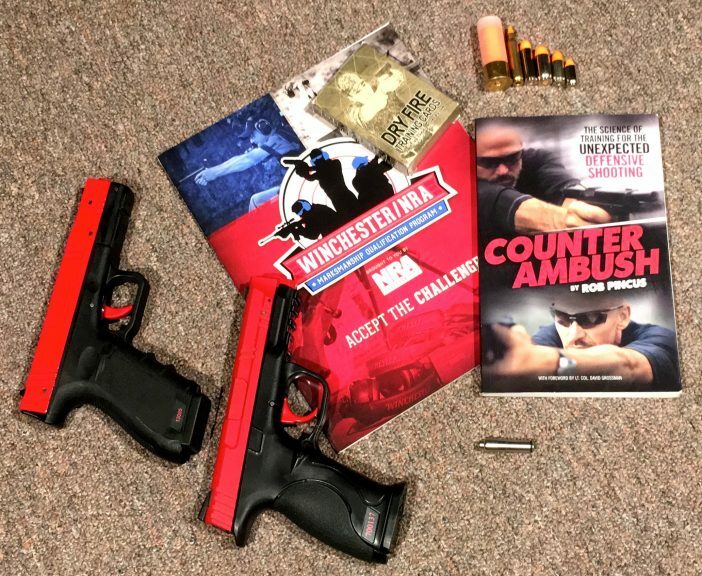 One concept discussed in the Counter Ambush book by Rob Pincus and subsequent online classes (an excellent example of distance learning or self-led instruction) is that most people cannot train live-fire every day, due to factors such as finances, range availability, and time. The circumstances are different for each individual, but we can each take steps and invest in training infrastructure to ensure we can maintain a daily training regimen. This will keep our skill sets honed and better prepare us to be an effective familia defensoris. Here are some of the practices and tools I use as part of my training infrastructure, and I often recommend them to my students to help them overcome their individual training limitations. Live fire is generally considered the best way to practice with a defensive firearm. But practice and training are two different things. I consider training as having an agenda and a goal to achieve at the conclusion of a live-fire session: going to the range with a “course of fire,” specific drills designed to develop, maintain, or master a specific skill or skills. Although we can learn something any time we pick up a firearm, simply firing a box of cartridges at a piece of paper without a predetermined end goal isn’t really a quality training experience. Working with a coach or instructor certainly helps us focus on goals because we are guided through an agenda and receive diagnostic feedback and corrective instruction. But unfortunately, most individuals do not have daily access to a range, daily access to a coach or instructor, and the finances to supply ammo for daily range excursions. Most trainers would agree that a customized, goal-oriented coaching agenda is the best thing for a shooter who wants to train. What about folks who don’t have access to a personal defensive coach or the money to spend on one? One option is the NRA/Winchester Marksmanship Qualification Program, a self-led program with a prescribed course of fire that shooters can shoot and earn ratings. The initial ratings are honor based and the program is self paced. Whether you want to earn ratings or bars or patches, the program gives the shooter an agenda and a goal-oriented course of fire. It is an excellent, time-proven program that NRA has been offering since 1903. My recommendation is to start with the Basic Pistol Qualification and work your way up to the Defensive Pistol Qualification Course of Fire. By the time you rate as Distinguished Expert in the Defensive Pistol II Qual, you will have sent a great deal of ammo downrange and certainly mastered skills. Taking a class is always a good use of your ammunition. Many excellent full-time and part-time instructors and options for your training dollar are available. Do your research. If you can, talk to the instructor before you sign up for a class. What is their background? What is their defensive philosophy and does it match yours? If you can’t talk to instructors, Google them and look for reviews of the individual or testimonials from their students. There is an abundance of value in classes ranging from a simple basic pistol course up to a two-day Combat Focus Shooting course and beyond. Building a dossier of training certificates is also something to take pride in. I am not a lawyer, nor do I play one on television, but that binder of certificates can also go a long way to helping your defense in court, if you ever actually need to use your particular tool of self-defense. What about those days we can’t make it to the range or when our ammunition budget has run out? There are some effective ways we can train at home or even at the office. The SIRT (Shot Indicating Resetting Trigger) Pistol by Next Level Training is a fantastic piece of hardware that simulates a Glock 17 or Smith & Wesson M&P and emits a laser when the trigger is pressed. Our flash sight memory is such that we can see and read where our shots are hitting. It also has a switchable secondary laser that indicates when the trigger is prepped. This can be very useful to help folks with fast trigger cycles and follow through. As the SIRT does not fire a projectile, you can train safely in your house or even in a gun-free office using targets, light-switch covers, trophies, or whatever you can imagine as your target. It is a wonderful way to practice “uncalibrated” in the morning before you have your cup of coffee. The SIRT is an investment, but for less money than a case of 9mm, you’ll be able to practice any time, day or night, and in your own home. Dry firing your own firearm is an excellent option that is free. Consult your owner’s manual or manufacturer if you are unsure, but 99% of all modern firearms can be dry fired without incurring damage to the gun. Safety precautions must be in place when dry firing. First, unload your firearm and purge the area of ammunition. If possible, use a room or area where you do not perform any other “gun activities.” The area should also have an “actual” safe direction and backstop that could take a ballistic hit if a negligent discharge did occur. Brick fireplaces or block walls work nicely. Dry fire is great for working the fundamentals, or drawing from a holster with your firearm. One great way to do this is to put up a mirror and use your own image as the target, which gives you something to aim at. The reflection gives you a great view of your holster draw and technique, and you can see where you have deficiencies. 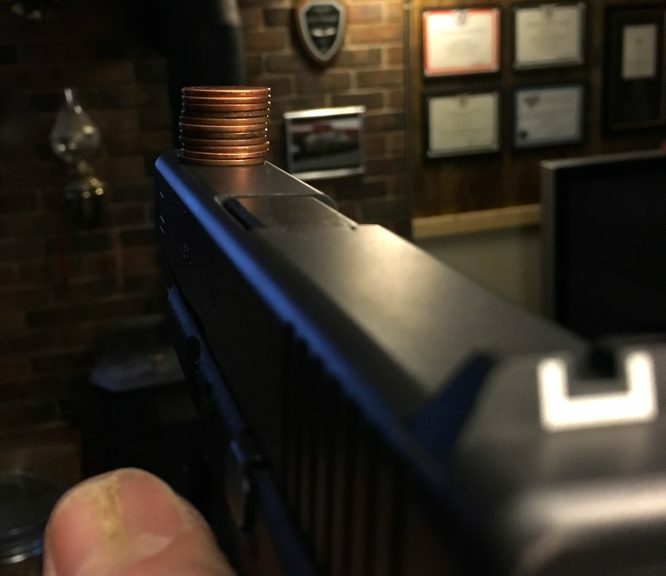 Have a partner place coins on the barrel or slide. If you can dry fire without the coins falling, then you are performing an excellent trigger cycle. Do this repeatedly and rest assured that neural pathway is getting stronger! If you want practice with loading, unloading, reloading, or clearing malfunctions, use dummy rounds. 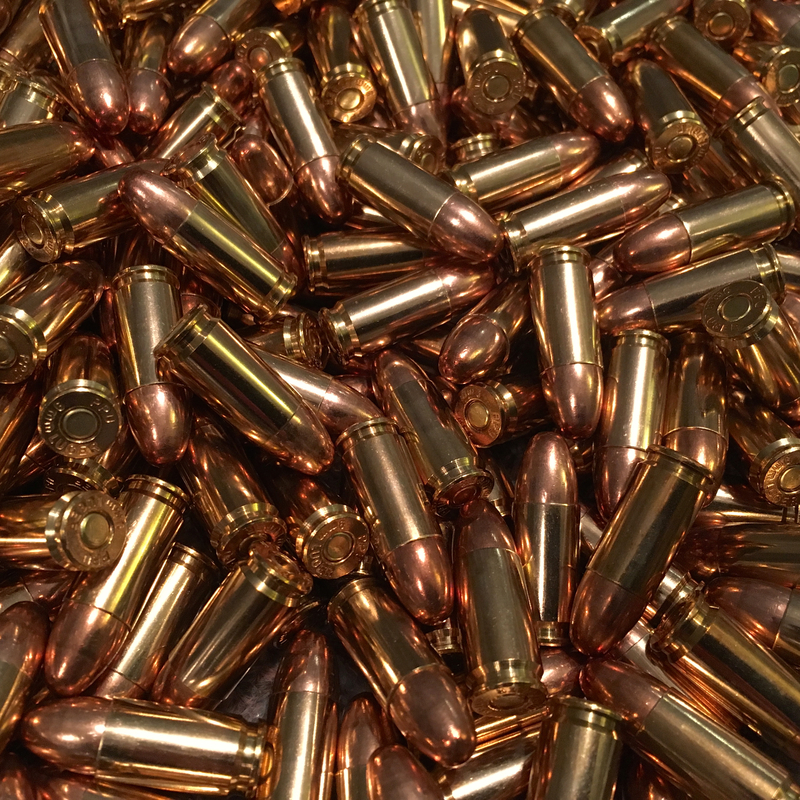 ST Action Pro makes high-quality dummy rounds for all the popular calibers and can be purchased for about $1 a piece. They have metallic cases and bright fluorescent-colored plastic internals so they are easily identifiable as training ammunition. During live fire, have a partner randomly slip dummy rounds into your magazines to simulate ammunition malfunctions. Another excellent dry-fire option is laser trainer rounds. The ones from companies such as Laser Ammo allow us to insert a laser cartridge into our own firearm. When the firing pin actuates the “primer” of the laser cartridge, a beam is emitted and we can see our shot placement. Much like using dummy rounds, Laser Ammo is also very useful when learning the “click” stimulus, for training tap-rack drills, and doing holster work. The obvious added benefit is that with the laser trainer, we can see our shot placement. One low-cost way to enhance the laser-training experience is using LASR software. LASR (Laser Activated Shot Reporter) software can be installed on most any old laptop using most any old webcam to create a complete target range in your home. 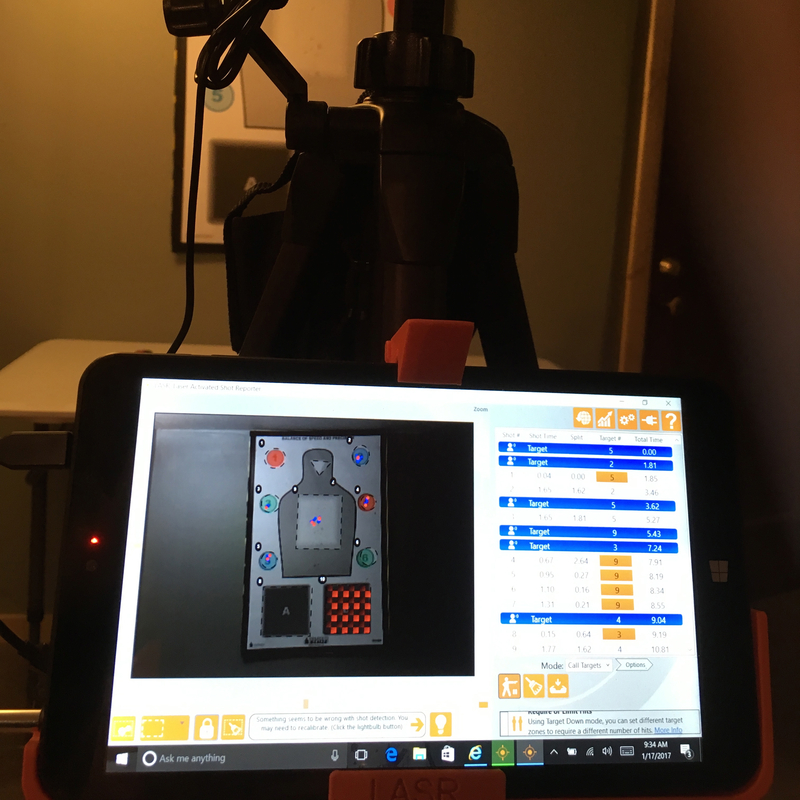 Put up targets or objects in the room, point the webcam at the objects, select the objects on the software (much like cropping a picture), and the software will recognize it as a target and read and record the light hits from your laser training product. The software has different modes where it will record hits and randomly call targets for you to shoot. I really enjoy running through a balance of speed and precision drill using the LASR “Call Target” mode with a CFS-BSP Target. LASR records shot time, shot numbers, and split times. It is also very useful from a diagnostics standpoint. LASR is downright fun to use and will work with any laser-training product. A lower-tech training aid to help with dry fire is the Dry Fire Training Cards, a deck of 52 cards with a different drill on each card. Shuffle them, pick a card, and rock the drill … luck-of-the-draw style. They include basic fundamental drills and advanced drills. The drills are fun and challenging and will give you an agenda during your dry-fire session. I recommend that after completing any dry-fire session, wait a few minutes before reloading your defensive tool. When you do reload, say out loud, “This firearm is now loaded. This firearm is now loaded. This firearm is now loaded.” You may feel a bit silly proclaiming to yourself that the firearm is loaded, but it is necessary to make the mental disconnect between dry fire and a reloaded firearm. You do not want to have a negligent discharge after a productive dry-fire session. 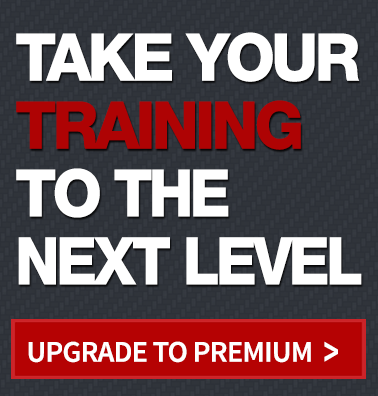 A new tool I’ve been using is the MantisX Firearms Training System. The MantisX attaches to the rail of your pistol or rifle and syncs to a smartphone app. 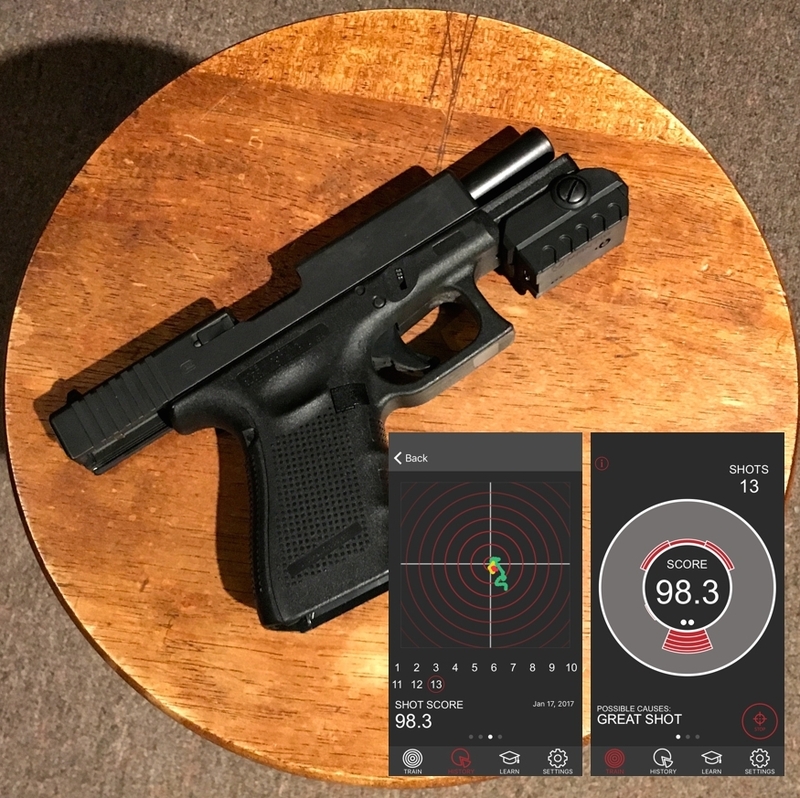 You tell the app if you are right- or left-handed, what model firearm you are using, and if you are dry or live firing, and it records information before, during, and after the shot. The system determines where and to what extent a deficiency exists based upon the movement of the firearm during the trigger cycle. MantisX gives you real-time feedback and offers multiple detailed graphing to get “scientific-y” with your diagnostics. It tells you if you slap the trigger, milk the grip, anticipate, and more. I am very impressed with its accuracy. It is an excellent tool for the day you want to hone the fundamental skill of trigger control. It also gives you a score, so as you train, you’ll keep going so you can best your high score, and before you know it, you’ve spent another 20 minutes training. It is a great tool for folks who cannot afford or do not have access to a coach, and for new instructors to help them learn and recognize shooting deficiencies. Consider that we build neural pathways in our brain (commonly incorrectly referred to as muscle memory) by performing slow correct repetitions. Physical experiential training can be had with live fire, dry fire, and simulated fire. Once the neural pathway is created in the brain, with experiential training, supportive training can further intensify the flow of neurons, and skills can be enhanced. This supportive training can be had by reading books, watching videos, and even visualization and mental training. Personal Defense Network is an excellent resource for articles and videos that will aid in your training, although since you are reading this now, I am most likely preaching to the choir. Lastly, mental preparation and visualization are very effective tools that should be part of our training diet, especially in the context of developing defensive strategies. And they cost no money! Donald Rumsfeld said after 9/11 that it was a “failure of imagination.” It is beneficial to visualize and imagine any scenario you can think of and mentally prepare a strategy that you could employ to deal with that incident. You can do this for every environment you and your family routinely find yourselves in. What if I am jumped in the parking garage? What if someone kicks my door in? What if I need to get my family into the safe room? Visualize problems and contemplate solutions. When individuals find themselves placed in situations they have never imagined, they typically freeze. Having a plan in mind will hopefully allow you to act instead of react. Go to the range as often as your finances and schedule allow, and use simulated training, modern technology, dry fire, videos, articles, and a little creativity to train every day. Adopting a well-balanced training diet will help you prepare yourself by mastering skills that may one day save your life or the lives of your family. train others in CCW/Home Defense in the very near future. Thank you for backing up my ideas. I am glad that you found the article to be helpful. Great article. I’ve just completed both The Basics of Pistol Shooting Phase I, II. I am deciding on moving up to a Defensive Pistol Qualification’s Course, but was wondering if at age 70, can I really get anything out of it? I’ll be 70 in a few months and I believe you’ll get out whatever you put in. Train and practice to get stronger and sharper. Even if you don’t increase, at our age you will maintain and that’s not a bad thing. I’m 85. Joints & stuff are no longer the greatest but I don’t intend to let my skills or brain deteriorate without a fight. Continued learning and ongoing training is your partner in the struggle. Stay with the winning/learning team. Thank you for all of this. I used to think I had issues whenenever I thought of using a firearm to defend myself or others, such as thinking of a convenient store robbery or some senario where I had to shoot or not shoot. I know I was and am headed in the right direction as far as training goes because I now learned it’s mental preparation an visualization of senario based training. Almost as good as Military training it is good training. Some of the training I had before Nam! I am a 1969 Drafted at 19. V/N Korean DMZ two combat runs. I know that the Brain and the weapon must work together. If not some body will die. I am starting a website as a man of God that will not rip people off, one they can trust. As you have done and but I will also have drop shipping. Any advice for me. God bless all.